View CGM and other vector or image graphics files, view, convert and print. SDI Office is a multi-purpose Windows application for viewing, conversion and printing graphics and image files. 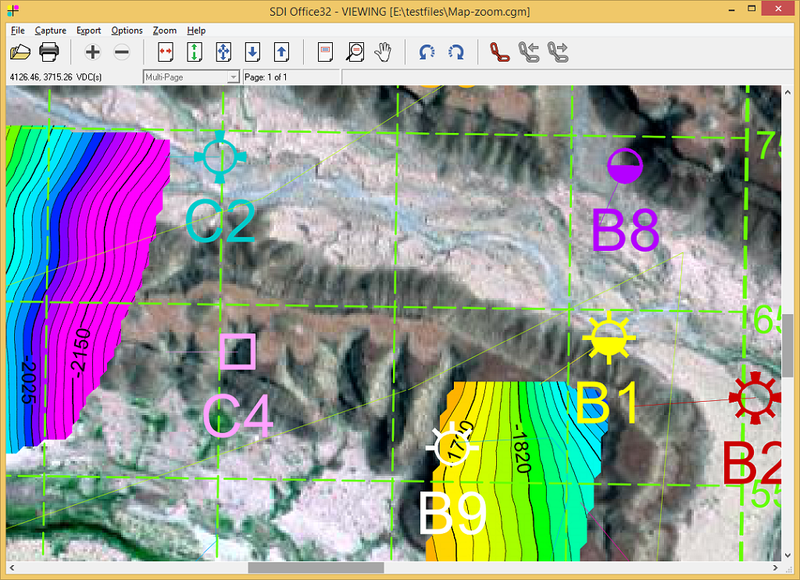 View multiple 2-D formats including CGM, PDF, PostScript, HPGL, DWG/DXF, EMF, TIFF, JPEG, PNG, BMP, XWD and CALS. Zoom, scroll and rotate the image and even copy and paste into associated Windows applications. Select and utilize the files hotpots. Print the whole file or a selected viewport with either standard Windows drivers or via the optional SDI APS - Advanced Printing System for more accurate printing control. Convert files, via the export feature, to the available formats of CGM, PDF, PostScript, DWG, DXF, EMF, SVG, TIFF, JPEG, PNG and BMP. Overcome arbitrary Windows plot length limits. Print seismic files, logs and/or maps at any scale or size. Scale your prints by page size or percentage. You also have the ability to scale your file for independent X and Y lengths. This is really helpful because you can scale a narrow file to fill a wider sheet without disturbing the length scale—this will keep the integrity of the file’s depth scale. Provides a consistent Graphical User Interface (GUI) for all printers. This is helpful if you are printing to various different printer types. Layout feature provides a thumbnail view of your well log image on virtual media prior to printing. Reduces printing costs by minimizing re-plots and wasted media. Have questions? Contact us for more info.